Most people in their forties, fifties, and beyond catch themselves saying something similar to this. Everyone has a mental image of the person they want to be, but few of us actually fulfill these wishes. Once people realize they are living a completely different life than they’d envisioned, they often think it is too late to change and carry on with the same old habits. Too many people settle for a half-lived life. Best-selling author John Lee has long been addressing the fallacy of this attitude in talks and workshops—and now he sets this program into book form. 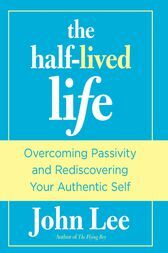 In The Half-Lived Life, he introduces and explains how passivity holds us hostage to old ways of doing things—and provides solutions on escaping this paralyzing state of mind, body, and spirit while increasing our emotional intelligence (EQ). He also shows the freedom to be gained via compassionate assertiveness—an outgrowth of setting boundaries and enforcing limits. Just as Lee’s seminars have successfully led many to find their authentic self in the second half of their life, so too will this book. John Lee is a best-selling author of seventeen books with more than 500,000 copies sold to date—including Flying Boy. He has been featured on Oprah, Dr. Oz, 20/20, The View, CNN, PBS, and NPR. Among the organizations and health facilities he has consulted for on issues of emotional well being are the Betty Ford Clinic, the Cleveland Clinic, and the New York Open Center.